Creating and maintaining timely PostgreSQL database schema documentation can be a tedious, time-consuming, and error-prone chore. DB Doc addresses these 3 issues by making it simple to generate accurate and timely PostgreSQL documentation however large and complex your database may be. Let’s take a look at how you can create great looking documentation for your PostgreSQL database in just a few minutes using DB Doc. 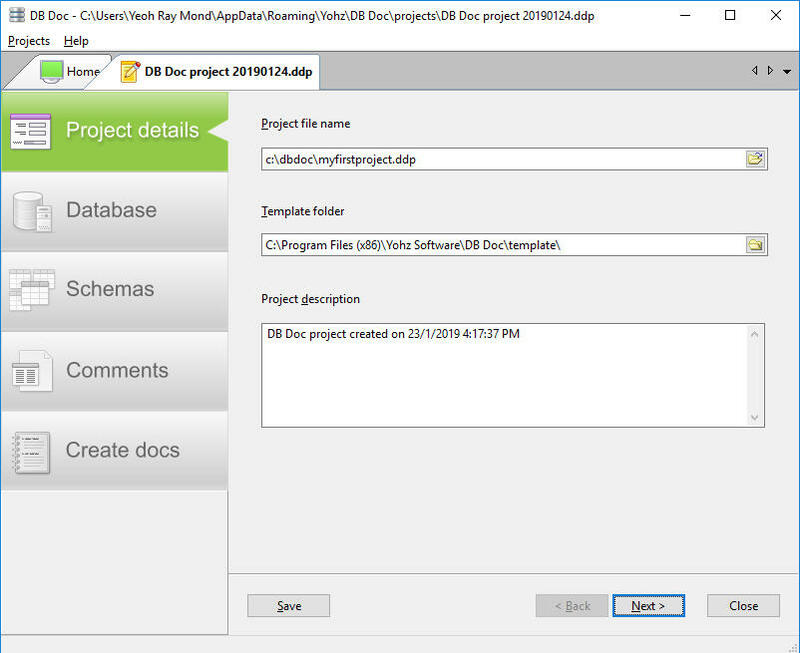 Once you have downloaded and installed DB Doc on your computer, start the DB Doc application. Click on the Create database documentation button. 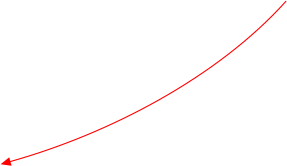 Enter the relevant details if you plan to use this project again in the future, or in a scheduled job. Click on the Next button. Enter the details of the PostgreSQL database you want to connect to and create documentation for. Click on the Next button. DB Doc will then connect to your database and retrieve the schema details. 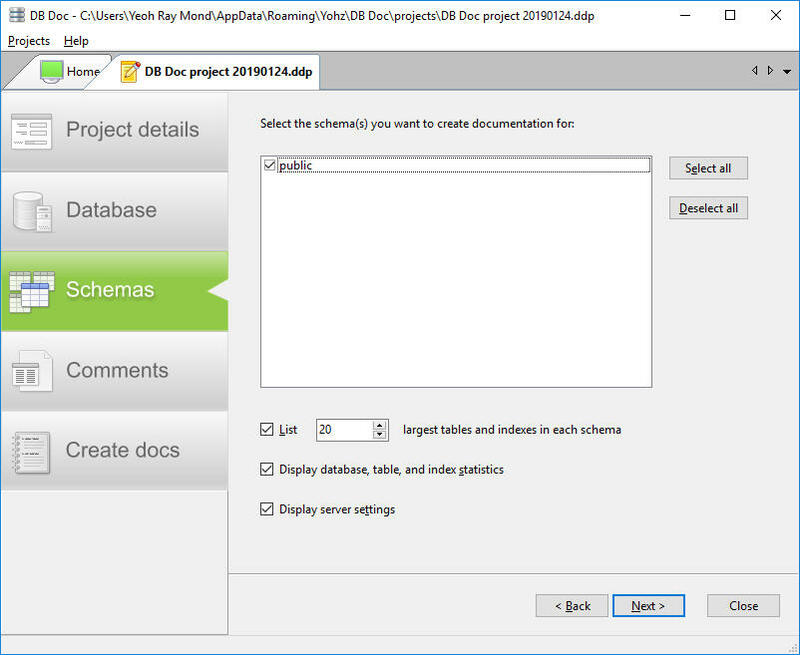 Once completed, you can choose which schemas to generate the documentation for, and if statistical data should be displayed. Click on the Next button once you have completed editing the object comments. You can now create your PostgreSQL database documentation in HTML, XML, CHM, PDF, and MS Word formats. DB Doc ships with templates so you can create your documents immediately. That’s it! 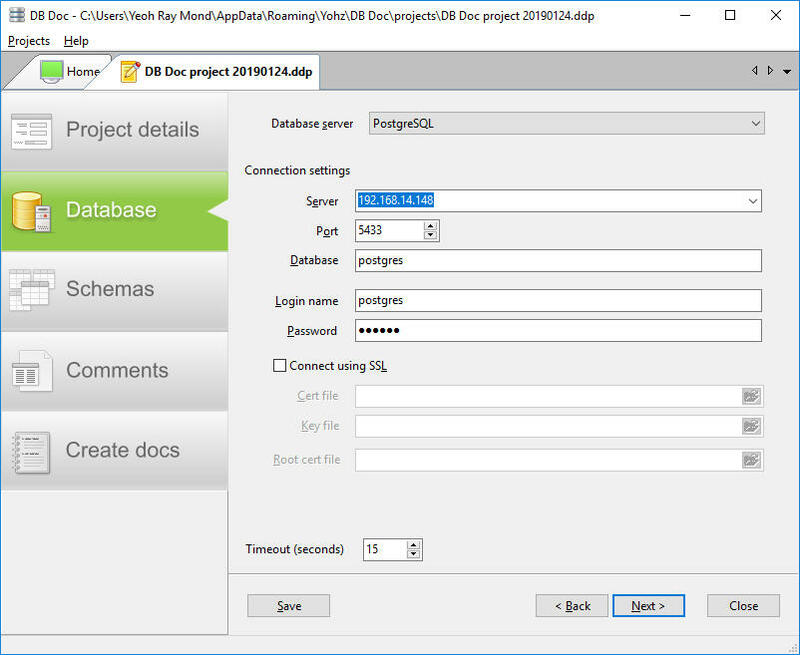 5 simple steps to creating great PostgreSQL database documentation. Download a FREE 14-day trial now and start creating documentation for your PostgreSQL databases right away. You may want to generate your database documentation frequently without manual intervention. DB Doc can do this easily using its command line interface. 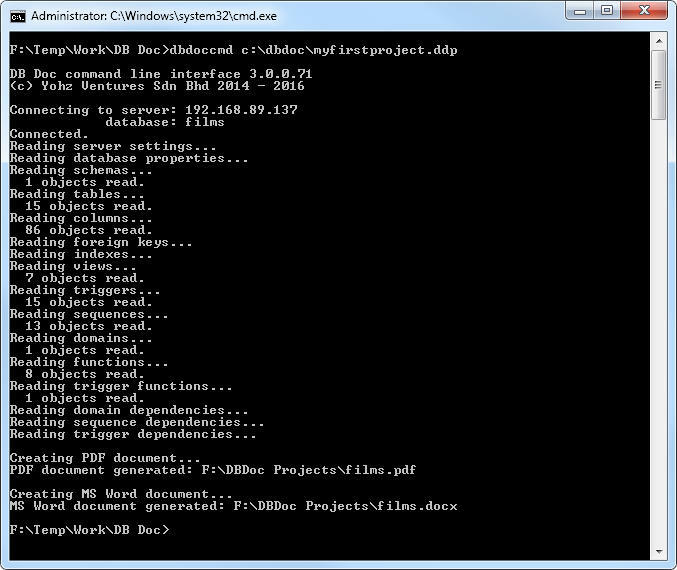 In the example above, we saved our project as myfirstproject.dpp in the c:\dbdoc\ folder. 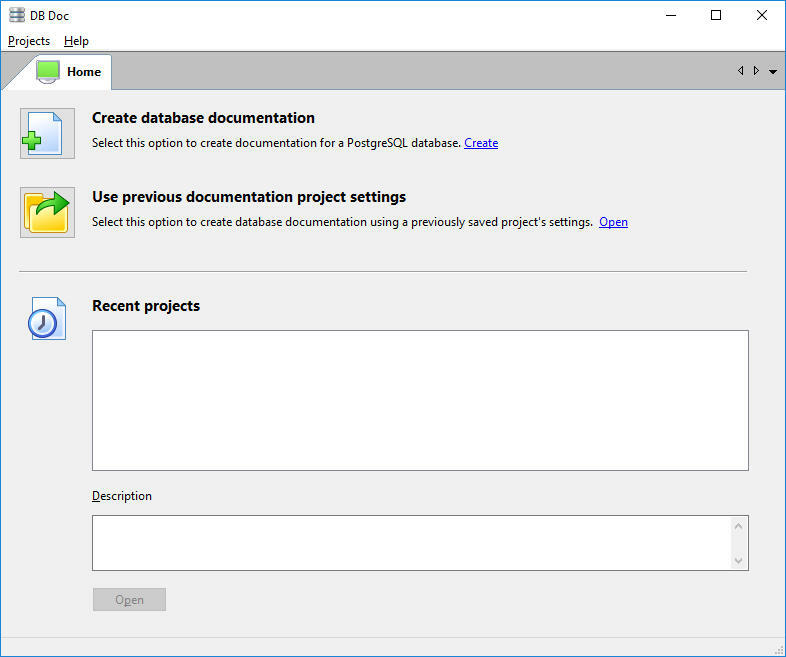 You can then run this DB Doc project using the DB Doc command line interface, and your documents will be generated using the settings you provided earlier. 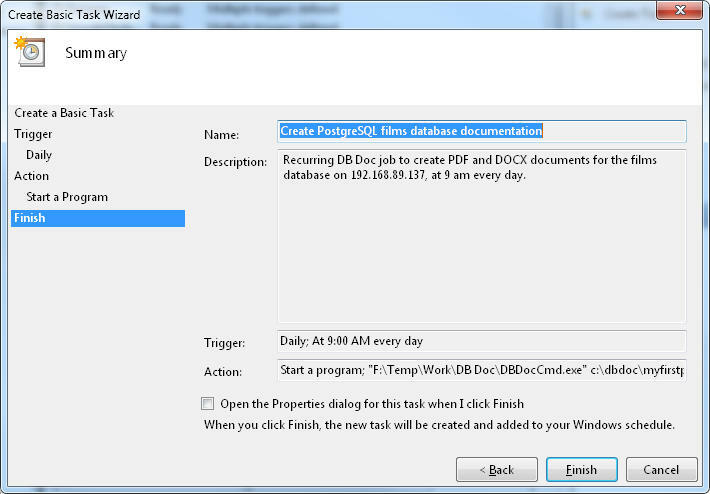 Next, you can set up a Windows scheduled task to automatically generate your documentation as frequent as you need. For example, we could set up a job to run every day at 9 a.m., so that every user has the latest schema documentation for reference first thing in the morning. Just 1 additional step to create a scheduled job, and you and your team will have timely and accurate database documentation at your fingertips. Stop wasting time and effort on manual and error-prone documentation tasks, and download a trial of DB Doc now. Download a free 14-day trial now, and start documenting your PostgreSQL database in minutes. 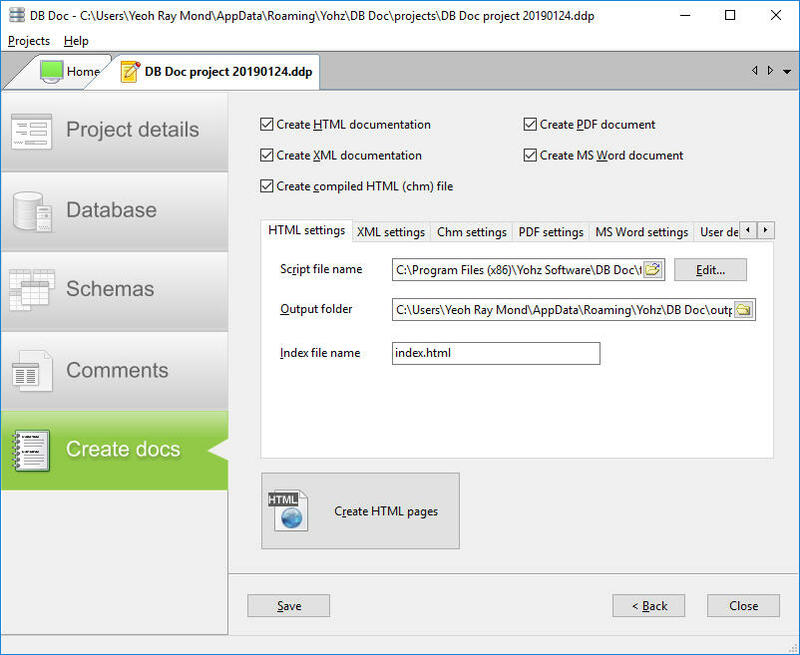 Take a look at some sample PDF, HTML, DOCX, and CHM documentation created by DB Doc. 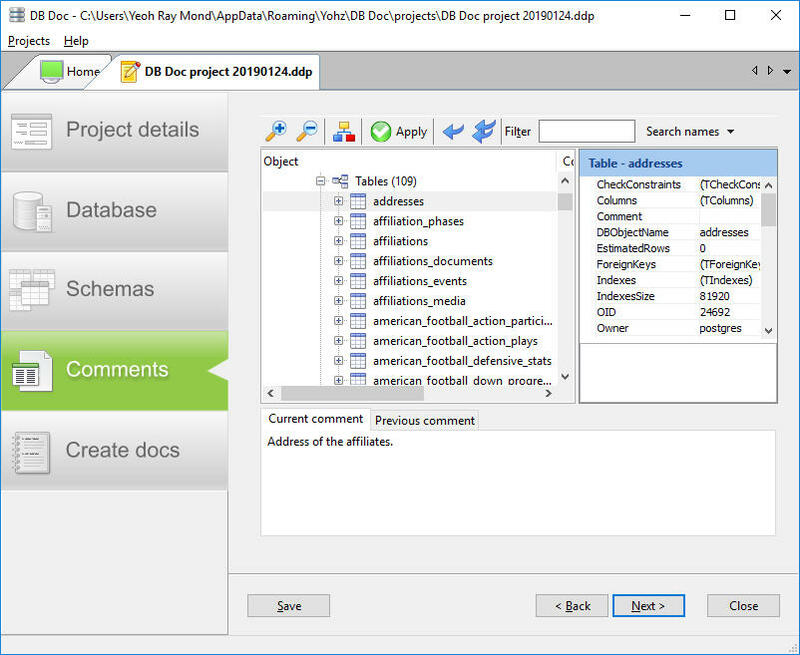 On the next page, you can then edit/update the comments for the various database objects in the selected schemas.